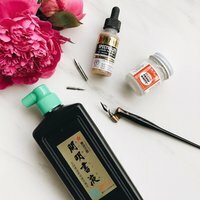 Terms and Conditions of Use for St. Blanc Calligraphy, LLC. 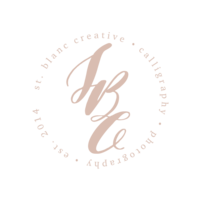 This website is owned and operated by St. Blanc Calligraphy, LLC, a Louisiana company. Our principal place of business is located at 7501 Highway 87, Charenton LA 70523. 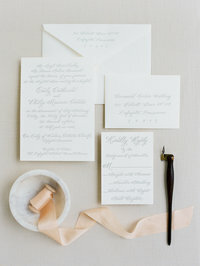 All programs, products and services are owned and provided by St. Blanc Calligraphy, LLC. (“Company” or “we” or “us” or “our”). The term “You” or “Your” refers to any user or purchaser of said program(s), product(s) or service(s) (the “Offering”). These Terms and Conditions of Use govern and define how You are allowed to use and access Company’s Offering. We reserve the right to update and change these Terms and Conditions of Use at any time, and will update them accordingly with the ‘date last updated’ at the top of this page. You are legally bound to these Terms and Conditions of Use whether or not you have read them. If You do not agree with any of our Terms and Conditions of Use, please email us at anna@stblanccreative.com and we will make reasonable efforts to remove your name, email and access to our Offering and website(s). 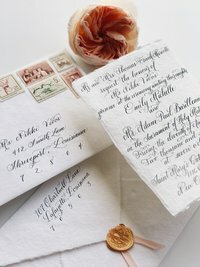 All images, text, designs, graphics, trademarks and service marks are owned by and property of St. Blanc Calligraphy, LLC, or the properly attributed party. It is a violation of federal law to use any of our intellectual property in whole or in part, and modification of any materials contained on this site is illegal and may be prosecuted to the fullest extent permissible should we choose to do so, including asking for financial penalties (damages) and/or an injunction forcing you to stop using our intellectual property immediately. Limited License. Any and all materials, paid or free, that You access on this or any related domains that contain our Offering are under the sole ownership or licensed use of St. Blanc Calligraphy, LLC. - Use our trademarks and copyrighted materials with Our consent and proper credit and marking, namely, citing ©St. Blanc Calligraphy, LLC as the source of the materials and marking any federally registered trademarks with ® or common law trademarks with ™. If you wish to use, publish or access any of our content, Offering(s) or related materials, You must do so by requesting permission prior to commencing use of the same by email Us at anna@stblanccreative.com. Even though our Offering is not necessarily something you can physically hold in your hand and walk away with, it is nevertheless considered theft to steal, infringe or otherwise violate these Terms and Conditions of Use. We reserve the right to prosecute infringers to the fullest extent allowed by criminal or civil statute in any jurisdiction allowed. You explicitly consent to personal jurisdiction in Louisiana by opting into or purchasing any Offering or accessing its related communications and/or materials. It is Your responsibility to secure your username and password from theft or any other means of unauthorized use that would violate these Terms and Conditions of Use. We do not store any whole credit card numbers or payment information, and instead, these are processed through third party processors such as Stripe and/or Paypal. By utilizing these payment processors to gain access to the Offering, You indemnify Us and instead assume any and all risk or liability for the security of the payment details, and agree to be bound by the third party payment processor’s applicable terms and conditions of use. Due to the nature of the services and/or products provided, refunds will not be given unless otherwise specified in writing. St. Blanc Calligraphy, LLC reserves the right to charge 1.5% interest per day upon any outstanding sum left unpaid on or after 14 calendar days from due date. After 30 days of outstanding payment, St. Blanc Calligraphy, LLC reserves the right to send you to collections, upon which you will owe the total amount of any outstanding payments plus any collection costs including reasonable attorney’s fees. You have the unilateral right to terminate your use and access to any of Our Offering(s). Please send an email to anna@stblanccreative.com to initiate this process. Termination will not excuse you of further payment. Upon confirmation of your termination, any and all outstanding balances will become immediately due and payable. Any existing balance that remains after 14 days from the date of termination will be sent to a collections agency, and You agree to be responsible for any additional charges, fees or costs associated with such a collection effort, including but not limited to reasonable attorney’s fees and court costs. Advertisers: We may use third party advertising companies to run and manage our ads, such as Facebook, Instagram, Pixel, etc. to produce ads that appears when you visit our Website or mobile app. These companies may use information about your visit to our website and other websites that are contained in web cookies (as described below) to offer you personalized advertisements about goods and services that might interest you. We cannot control the activities of, such other advertisers or web sites. You should consult the respective Privacy Policies of these third-party advertisers for more detailed information on their practices as well as for instructions about how to opt-out of certain practices. Our website is hosted by servers located in the United States of America. Therefore, if you reside in the European Union, some of your data will be transferred internationally to those servers. Transfers will be protected by appropriate safeguards, namely the EU-US Privacy Shield. More information on the Privacy Shield can be found at: https://www.privacyshield.gov/welcome. Update Account Information: You have the right to update or change any information you have provided to us. To update or delete your information, please contact us at anna@stblanccreative.com. Emails And Communications: You may opt out of receiving future email correspondence from us by checking the appropriate box when you register for the account or make a purchase. You may change your communication settings by contacting us at anna@stblanccreative.com. Marketing Communications: You may opt out of receiving any third party marketing communications or having your personal information used for marketing purposes. You may do this by contacting us at anna@stblanccreative.com.